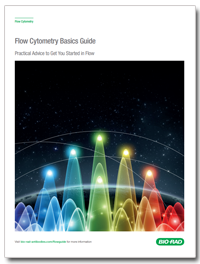 We have updated our popular flow cytometry guide which still contains a basic overview of all the important facets of flow cytometry without delving too deeply into the complex mathematics and physics. We have expanded the guide to include new sections on controls, experimental design, multicolor panel building, uses of flow cytometry and more. You can view the updated flow cytometry guide online, download it in a PDF form or request a free printed copy.